"What’s Going on in There?" Of all the books I read while pregnant this was my favorite. This in itself should tell you a lot about me. 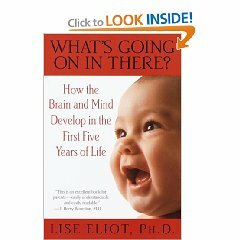 “What’s Going on in There?” was written by Lise Eliot, a neuroscientist and mother of three. It explains in scientific but layman’s terms how the brain develops from in utero to the first five years of life. It talks about the critical role of experience/environment for babies, diet, why milestones happen in a certain sequence. All the things you wondered about: when can babies see, hear, feel emotion and how to help them develop all these senses, it’s all in here. It is by far one of the best parenting books. I go back to it quite often and will probably do so until my second…hope to have a second, turns 5.